Struggling to make an impact: Ed Miliband must reject the Tory Party’s narrative about the need for austerity and bring forward a vision for the future that really does make us ‘One Nation’ again, rather than hanging on David Cameron’s neoliberal coat-tails, as many former Labour voters believe. The political debate is all about the Labour Party again today – as it has been since the Budget. The newspapers and websites are full of advice for the party, which is now clearly seen to be struggling to gain any kind of a foothold with electors who have become disillusioned at what might best be called the Party of Very Little Opposition. 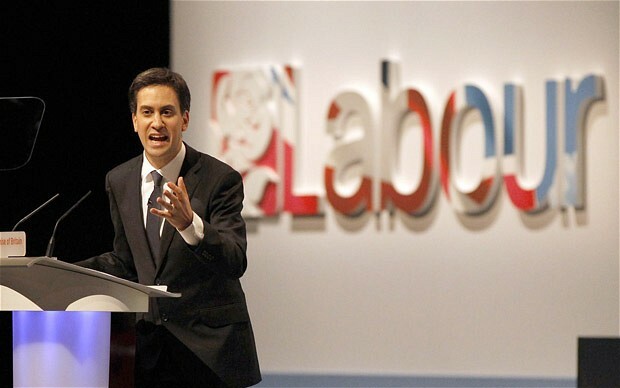 Labour “must adopt new principles” according to an alliance of thinktanks and party intellectuals who have written to The Guardian; Ed Miliband has been told “don’t play safe” with the party’s manifesto according to an article on the same paper’s site. The BBC News site has words from left-wing MP John Mann, calling on his party leader to stop trying to be “too clever” and be “much clearer” in setting out his policies. We can probably discount the Telegraph article by Dan Hodges, claiming that Labour is “closed for business”. It plays to right-wing readers’ prejudices just a little too much. Will Ed pay any attention to these pleas? Evidence suggests he will not. I should clarify from the outset that, as a Labour member, I want the Party to win in 2015 (and also to gain the lion’s share of the vote in May’s European elections). But Miliband seems to be living in a world of his own, insulated from the rest of the Labour Party – not to mention supporters of Labour ideals who are not members – by a small group of (not-so-special) advisers who, it’s claimed, intercept any decent ideas before they get to the party leader and spin them until they turn to drivel. Whether this is true or not seems immaterial as this is the perception of the general public. As I write this article I have just received a comment stating that “Miliband’s strategy for the next election seems to be a) to accept the Tory frame of reference for any given argument and b) to then concede the field of battle on that issue, whatever it is, without a shot being fired.” This is a common complaint, and Labour has no answer to it. Why do Miliband, Balls, Tristram Hunt (notably), Rachel Reeves (lamentably) and all the other Labour frontbenchers blithely accept the Coalition’s terms of reference on any issue, against the wishes of their own backbenchers, their party as a whole and the public at large? Are they really just a gang of greedy moneygrubbers, determined to screw the country for whatever they can get? That in itself would be a betrayal of Labour Party ideals and their constituency parties should deselect them if members believed that to be the case for one moment. Are they a gang of neoliberals, their political philosophy so close to that of the Conservatives that you can’t get a credit card between them? This rings threateningly true in the cases of Oxford PPE graduats Ed Balls and Yvette Cooper, ex-Bank of England employee Rachel Reeves and Tristram Hunt. But Ed Miliband is (famously) the son of a Marxist. He, above all, should know better. The trouble is, David Miliband is the son of the same Marxist and he was as much a part of the neoliberal New Labour Red Tory deception as Tony Blair and Gordon Brown. Become the voice of the people. The meaning is clear – Labour is not currently representing anybody at all. Is this true? Let’s look at some of the other comments on my (left-leaning, let’s not forget) blog. These are from people who are generally sympathetic to Socialism and who should, therefore, see Labour as the natural home of their vote. What do they say? If Ed Miliband was reading this, I would be asking if he was getting the message yet (are you, Ed?) and what he proposes to do about it. You think not? Let’s have some more comments from people who should be supporting Labour – I’ve got plenty of them! This is how left-wing voters (and the squeezed-middle waverers to whom Ed Miliband keeps trying to pander) see the modern Labour Party: Carbon-copy Tories with no fresh ideas who aren’t worth the effort of voting. If any of Ed’s shadow cabinet is okay with that description, he needs to sack them and bring in someone with a clue. And he needed to do it last year. If the Conservatives win in 2015, it seems clear that responsibility will lie as much with Labour’s failure to provide any clearly-visible alternative. We have already seen carnage inflicted on the poor, the sick and disabled, and a Conservative-only government (or in collaboration withUKIP) would increase that bloodshed tenfold (senior citizens take note: the bribe you were given last week was a trick and if you vote Conservative, many of you will not live to rectify your error at another election). Unless Ed Miliband sorts out his party – pronto – that blood will be on his hands as well, and the people will not forgive him. Note that I did not say they won’t forgive Labour. I said they won’t forgive Ed Miliband. Words cannot describe the way people feel at what has been done to them by the Coalition. If Labour reveals even the slightest element of complicity, I wouldn’t give a farthing for Miliband’s safety. That goes for the rest of the shadow cabinet too. Vox Political relies on popular support for its livelihood! The BBC has reported findings by the Institute for Fiscal Studies, showing that the Coalition government will be less than halfway through its planned spending cuts by the end of the current financial year (March 31). The organisation said 60 per cent of the cuts were still to come. This raises a few urgent questions. Firstly: This government was formed on the promise that it would balance the books by 2015, which presupposes that its entire plan for doing so would be in place long before then. We know that this ambitious claim was dismissed after years of failure, but part of the reason for this failure was that George Osborne stopped a recovery that was already taking place, and which would have led to economic growth of 20 per cent by now, if it had been allowed to continue (according to Michael Meacher MP). My question, therefore, is: Have the Conservatives been working to ensure that they would have an excuse to make more cuts, rather than to restore the economy and balance the deficit? Secondly: We may presume that these further cuts will be inflicted over a period of years (as even the Tories know it is important to enact change gradually, rather than inflict sudden shocks on the economy that could create entirely unforeseen consequences). Are the Coalition parties assuming that they will be re-elected next year, and is it not supremely arrogant of them to believe this, considering the harm they have caused so far? Thirdly: If the Coalition parties do want to be re-elected, it is clear that they will need to try to bring a majority of voters back on-side. Therefore we may reasonably expect to see all sorts of gifts coming our way over the next year – tax breaks or whatever else they can devise – aimed at increasing the amount of money in our pockets. However, knowing that 60 per cent of the Tory/Lib Dem cuts process is still to come, this means they will want to make even more cuts if they are returned to office. Why would we want to give them our vote, in return for presents they’ll grab back as soon as they’ve got what they want? Fourthly: Iain Duncan Smith has inflicted £28 billion of cuts on people receiving benefits from his Department for Work and Pensions. If the IFS statement is accurate, then the total amount he’ll want to cut is a staggering £70 billion. If we consider that the amount spent on pensions (more than £100 billion) is safe, this leaves only tiny amounts for all the other benefits supplied by the DWP. Are people currently on Jobseekers’ Allowance to get nothing in the future? What about disabled people getting DLA or PIP? How about all the many, many people on Employment and Support Allowance, including those currently going through the appeal process because of wrong decisions? Mr… Smith might claim that all these benefits are being rolled into Universal Credit, but that won’t happen until 2016 or 2017 according to his own estimates, and the rest of us know that it’s not going to happen at all. Will we have any benefit system left if these cuts continue – or will the Tories try to trick us into buying duff health and employment insurance policies from their friends at Unum instead? The BBC report said George Osborne wants a budget surplus by 2018-19, but “additional spending, population growth and extra demands on the NHS meant more cuts were needed”. This statement is not supported by any source material and we may take it this is a further sign of BBC right-wing bias. The additional spending was made necessary because of unintended consequences of the cuts – the Tories got their sums wrong. Population growth, if due to the EU immigration that everyone complains about, will have led to a net growth in the economy as it has been proved that migrant workers from the European Union contribute more to the Treasury than they ever take out – so this is not a cause of increased spending. If the indigenous British population has been growing faster than expected, let us remember that Child Benefit is to be restricted to the first two children in a family (Cameron has denied it so it must be true) and therefore any further growth in individual families will have no bearing on the government’s bank balance. Extra demands on the NHS are a thorny subject as the Coalition promised to inject billions of pounds into the health service but no evidence has yet appeared to show that it has. Since this money was promised many years ago, it should have been included in national budgets and should not be a burden now. The IFS also reports that there is no evidence of a housing bubble in the UK, as a result of Osborne’s ‘Help To Buy’ scheme. This was introduced last year, when Osborne realised that his austerity programme had failed and resorted to a Keynesian ‘pump-priming’ scheme to boost the housing market. Fears that this would lead to a debt-fuelled ‘bubble’ made commenters like myself cautious about the plan. However, if there are no signs of a debt-fuelled bubble, then we should consider this to be proof that Keynesian economics was always the way forward and austerity has led us up an economic dead-end for the past four years. This means none of Osborne’s ridiculous cuts were necessary (barring a few to eliminate waste and corruption – but under a Conservative-led regime we have no evidence that these took place and every reason to believe the opposite to be true. Look at the current ‘cronyism’ row over the appointment of Conservative ‘yes’-people to senior quango posts). It also means the government and the right-wing media have been lying to you for four long years – and will continue doing so in self-justifying stridence for another 14 months to come. But don’t ever let them convince you their cuts are necessary. 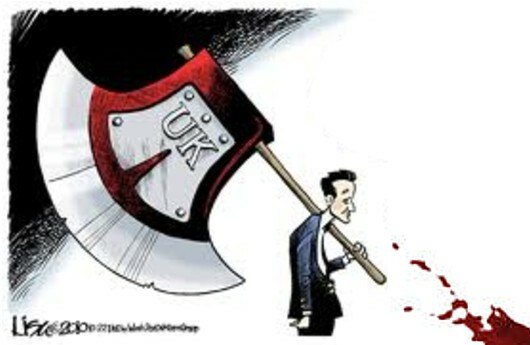 Vox Political won’t inflict any cuts on you! But we can’t deliver value for money without funds. That’s why YOUR help is vital. 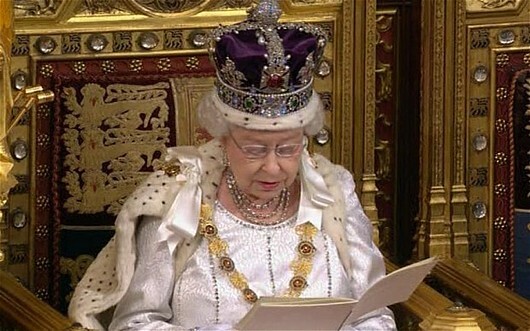 A true pro: It is a testament to the Queen’s professionalism that she is able to get through her speech at the annual opening of Parliament without either laughing at the stupidities or choking in horror at the implied threats to her citizens. “My government’s legislative programme will continue to focus on building a stronger economy so that the United Kingdom can compete and succeed in the world.” Focus on it, but do nothing about it. “It will also work to promote a fairer society that rewards people who work hard.” If you haven’t got a job, you’re shafted. “My government’s first priority is to strengthen Britain’s economic competitiveness. To this end, it will support the growth of the private sector and the creation of more jobs and opportunities.” There is no intention to take any action in this regard; the government will simply applaud actions taken by others. “My ministers will continue to prioritise measures that reduce the deficit – ensuring interest rates are kept low for homeowners and businesses.” Interest rates are nothing to do with the government. It is easy to make promises when no action is required. “My government is committed to building an economy where people who work hard are properly rewarded. It will therefore continue to reform the benefits system, helping people move from welfare to work.” My government is committed to building a low-wage economy where people have to work hard simply to keep what they’ve got. It will therefore continue to erode the benefits system, forcing people to move from welfare to destitution as a warning to those who’ve got jobs, that this will happen to them if they make a fuss. “Measures will be brought forward to introduce a new employment allowance to support jobs and help small businesses.” A bung for our friends. “A bill will be introduced to reduce the burden of excessive regulation on businesses. A further bill will make it easier for businesses to protect their intellectual property.” Deregulation worked so well with the banks in 2007, we thought we’d give other businesses a chance to ruin the economy. And it’s not enough that Facebook now owns everybody’s photographs – corporations want everything else as well. “A draft bill will be published establishing a simple set of consumer rights to promote competitive markets and growth.” The rights of the consumer will be restricted to what we say they’re allowed, to protect corporate freedoms. “My government will introduce a bill that closes the Audit Commission.” We don’t want the public to know the facts about our spending and where it goes (into our pockets). “My government will continue to invest in infrastructure to deliver jobs and growth for the economy.” But we’re not saying where the money will go (into our pockets). “Legislation will be introduced to enable the building of the High Speed Two railway line, providing further opportunities for economic growth in many of Britain’s cities.” Future economic growth, of course – we won’t see the benefit for many, many years. “My government will continue with legislation to update energy infrastructure and to improve the water industry.” At huge cost to everybody who has to pay the bills. “My government is committed to a fairer society where aspiration and responsibility are rewarded.” This is meaningless. “To make sure that every child has the best start in life, regardless of background, further measures will be taken to improve the quality of education for young people.” This is meaningless. “Plans will be developed to help working parents with childcare, increasing its availability and helping with its cost.” Private childcare organisations, starting cheaply but costing more as they get a grip on parents. “My government will also take forward plans for a new national curriculum, a world-class exam system and greater flexibility in pay for teachers.” We’re going to stamp on teachers hard. And the new national curriculum means nobody from state education will be able to compete with our children at Eton. “My government will also take steps to ensure that it becomes typical for those leaving school to start a traineeship or an apprenticeship, or to go to university.” We’ll shoehorn the state-school mob into something under threat of destitution, and save university for people who can pay for it (like us). “New arrangements will be put in place to help more people own their own home, with government support provided for mortgages and deposits.” More second homes for Tory voters, as set out in the Chancellor’s Budget speech in March. “My government is committed to supporting people who have saved for retirement.” If they have savings, they won’t need the national pension and can give it back, like Iain Duncan Smith suggested. “Legislation will be introduced to reform the way long-term care is paid for, to ensure the elderly do not have to sell their homes to meet their care bills.” They can die there instead. “My government will bring forward legislation to create a simpler state pension system that encourages saving and provides more help to those who have spent years caring for children.” It’ll encourage saving because it won’t be enough; and carers can have the kids taken away from them. “Legislation will be introduced to ensure sufferers of a certain asbestos-related cancer receive payments where no liable employer or insurer can be traced.” Otherwise we’ll get the blame for abandoning them. “My government will bring forward a bill that further reforms Britain’s immigration system. The bill will ensure that this country attracts people who will contribute and deters those who will not.” We’re scared that UKIP is taking our voters away. “My government will continue to reduce crime and protect national security.” We will privatise the police, MI5 and MI6. “Legislation will be introduced to reform the way in which offenders are rehabilitated in England and Wales.” If you thought our prisons were schools for criminals before, we’re turning them into universities. “Legislation will be brought forward to introduce new powers to tackle anti-social behaviour, cut crime and further reform the police.” We will privatise the police and introduce curfews. “In relation to the problem of matching internet protocol addresses, my government will bring forward proposals to enable the protection of the public and the investigation of crime in cyberspace.” We want to know how it works so we can make money off the internet. “Measures will be brought forward to improve the way this country procures defence equipment, as well as strengthening the reserve forces.” We’ll buy the cheapest equipment we can find and ask the reservists to do it for no pay. “My ministers will continue to work in co-operation with the devolved administrations.” Wales, Scotland and Northern Ireland will get even less cash. “A bill will be introduced to give effect to a number of institutional improvements in Northern Ireland.” It’s too peaceful over there and we need something to distract the plebs from the mess we’re making in the rest of the country. “Draft legislation will be published concerning the electoral arrangements for the National Assembly for Wales.” If we give the sheep the vote, they might vote Tory. “My government will continue to make the case for Scotland to remain part of the United Kingdom.” We want their money; we want their oil. “Members of the House of Commons, estimates for the public services will be laid before you.” Prior to privatisation. “My government will work to prevent conflict and reduce terrorism. It will support countries in transition in the Middle East and north Africa, and the opening of a peace process in Afghanistan.” We want their money; we want their oil. “My government will work to prevent sexual violence in conflict worldwide.” We can’t even stop it here. “My government will ensure the security, good governance and development of the overseas territories, including by protecting the Falkland Islanders’ and Gibraltarians’ right to determine their political futures.” They’re strategically important so we’ll rattle the sabre for them. “In assuming the presidency of the G8, my government will promote economic growth, support free trade, tackle tax evasion, encourage greater transparency and accountability while continuing to make progress in tackling climate change.” We’ll blame the other nations when none of these things happen. That’s not a promise; it’s a threat.